Surprisingly enough, in so many years of staying in Bangalore, we had never been to Coorg before. Last week was my first visit to Coorg and the Tibetan settlement at Kushalnagar was on the list of things to do. The visit to the Namdroling monastery was a superb experience overall and it's the place you'd like to visit if Ladakh is too far for you. Having missed the trip to the mountains this year, the trip to Bylakuppe made up for atleast a fraction of the Ladakh experience. 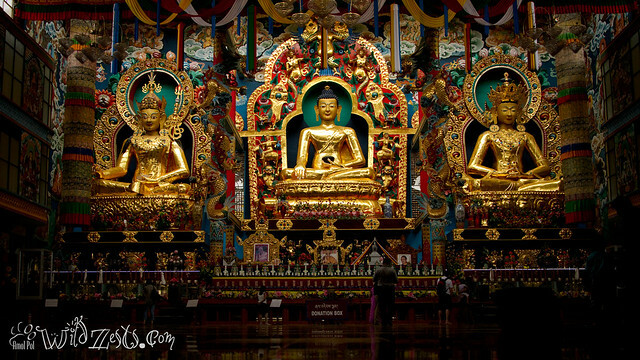 The monastery has a huge golden Buddha statue, with Padmasambhava and Amitayus on either sides. The gold coated statues with the light falling through the ceiling quickly gets you to a calm and you could easily sit there for hours and keep staring at nothing.